to train the men who would fight the next war. training. Some sort of jump simulator was needed. In Russia, they had been building such devices since the twenties. They were primitive affairs; simple wooden towers from which to jump off of. Jumpers were guided down by a single cable and frequently dashed against the side of the tower. In spite of this, the towers proved to be a popular recreational activity in parks and collectives across the Russian Empire. Retired Naval Air Commander James H. Strong had witnessed the training of paratroopers in Russia and considered the risks of such training devices to be unacceptable. Spurred on as much by patriotism as by profit, he set off to design a safer jump for the American armed forces. Strong's design, patented August 7, 1936, included a strong steel tower with electric motors to tow the chute upwards and a series of 8 guide cables in a circular arrangement about the chute to prevent swaying and unpleasant contact with the tower. Various versions of his design were built on his estate in Highstown, NJ in 1936 - 1937. Much to Strong's surprise, he soon discovered that one didn't have to be a paratrooper to enjoy being flung off a 250 foot tower. Hundreds of passing motorists stopped to request rides. Spurred on by this favorable public reaction, he adopted his military design for general use. Shock absorbers were placed at the landing point "to ensure happy landings." The military style single sling seat was replaced with a more comfortable (and romantic) two passenger version. The chute was enlarged to a 32 foot diameter, 8 feet larger than standard military issue. and American armed forces (the U.S. Army still operates a Strong jump at Ft.
at the urging of worried Fair publicity agents. The most bizarre incident at the Jump occurred on August 25, 1940: the "Parachute Wedding" of Arno Rudolphi and Miss Ann Hayward. As photographers, the wedding party and band looked on from other chutes, the couple wed, kissed and went into freefall. Fair exhibitors loaded the newlyweds down with gifts and the next day, headlines proclaimed "No Man On Earth is Good Enough for Ann." during the war years, when the public fascination with military gadgets ran high. But interest waned in such things after the war and the Jump was too labor intensive (it required three operators for each chute) and sensitive to wind conditions to turn a profit without steady crowds. Still the ride operated through the fifties and sixties. An attempt was made by the Tilyou's to sell it to the Japanese, but the disassembly and freight costs proved to be far greater than the selling price. Steeplechase Park itself closed after the 1964 season, bought and razed by Fred C.Trump for housing that was never built. 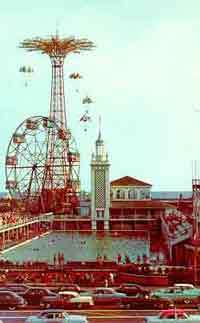 But the Parachute Jump survived, presumably saved by the ever increasing cost of demolition that had kept it at Coney since 1941. 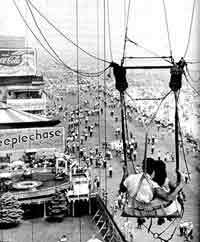 The Jump continued to operate until 1968, part of a group of small scale rides operated on the now nearly vacant lot. From 1968 on, the Jump was essentially left to rust in the salt air. In 1971, the New York City Parks Department put the Jump up for sale. No bids were received. Plans were prepared for its demolition. 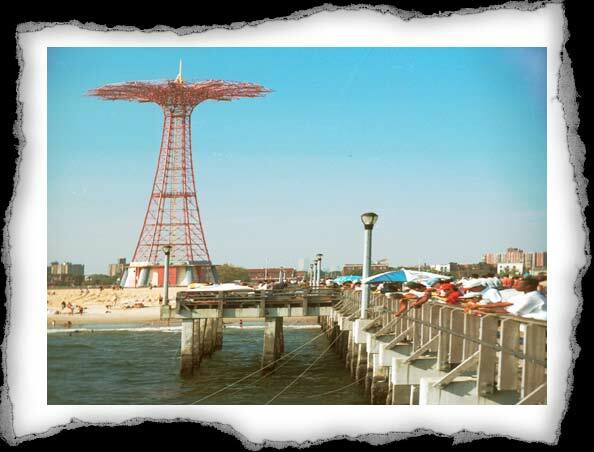 "Any New Yorkers who have a nostalgic feeling for the parachute jump had best take a look at it, because it will soon disappear from the horizon," said the city's Real Estate Commissioner at the time. 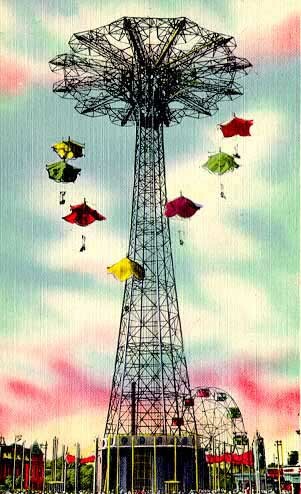 Meanwhile, the Coney Island Chamber of Commerce filed a proposal calling for landmark status and conversion of the tower to "A Beacon of Welcome, the Steeplechase Parachute Light." It took over four years for the landmarks commission to hold a hearing. On July 12, 1977, the Jump was declared a city landmark. Unfortunately, the city Board of Estimate overturned the designation, concerned that preservation of structure was "a luxury we can not afford." Threats of demolition were once again made, but a price tag of $250,000 and public outcry scuttled the idea. For the next five years, the Jump was ignored, again left to rust in an empty lot. In 1982, a major structural survey concluded that the Jump was fundamentally sound but suggested a half-million dollars in stabilization work to be done. No work was done. In 1988, the Parachute Jump was declared a city landmark for a second time, surely some sort of record. This time the designation stuck, but by then the structure had deteriorated even further, prompting one reporter to write "it is scarier now to stand under it than it ever was to ride it." The nineties brought new threats of demolition. The Buildings Department found the tower structure to be unsafe. Stabilization costs were now estimated to be more than $800,000. Fred C.Trump, apparently intent on finishing the destruction he had started 25 years before, offered $400,000 if the Jump was torn down. But the city had no choice; the structure was a landmark and had to be preserved. Work began in early 1992. An unsafe concrete platform was demolished. Corroded steel members were replaced. Dangling guide cables that once swung menacingly in the wind were removed. The Jump was painted, for the first time in at least 25 years, in its original colors. Coney once was. And with its new coat of paint, fresh steel and landmark status, the Steeplechase Parachute Jump seems ready for another 25 years. 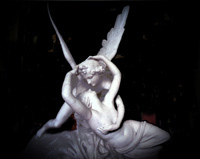 These images are the property of the artist and may not be downloaded, manipulated, or reproduced without prior written consent.